Some weeks ago, this column identified six specific factors to watch out for over the course of the campaign on the latest referendum question posed to Irish voters. The six factors were as follows: the overarching context; the tenor of the Yes campaign; the packaging of the No campaign; Fianna Fáil’s management of internal dissent to its official endorsement of a Yes vote; the difficulties that support for the referendum as the junior party in government might occasion for the Labour party; and the impact of the campaign on Sinn Féin’s political fortunes. On Friday, June 1st, we will know if Ireland has decided to join or to reject the fiscal compact, which will impose a stringent requirement of balanced budgets, but will also facilitate access to funding from the European Stability Mechanism if this country requires another bailout in future. As the day of reckoning is now upon us, it is worth examining how each of the six factors above has played out. In addition, it is worth considering how a seventh factor, voter turnout, might influence the outcome of the vote on Thursday. The overarching context has helped to shape the contours of the campaign. 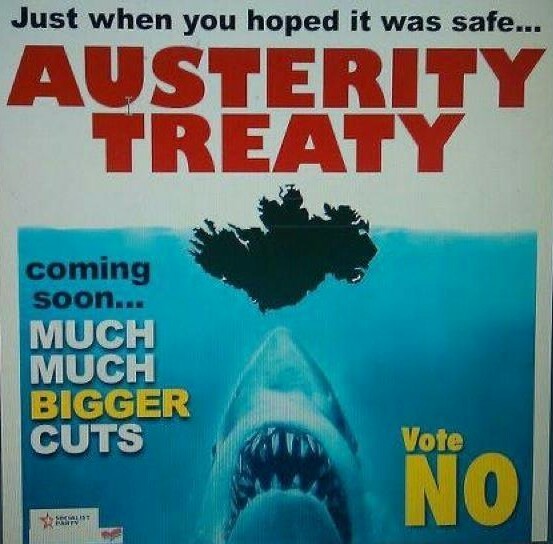 Election posters advocating a No vote cite water charges, a property tax and continued austerity as reasons for Irish voters to reject the referendum. And the harsh realities of these new taxes and spending cuts, coupled with general anger at the current government, will doubtless combine to produce a lot of No votes. It is hard to see how voting either Yes or No, however, could facilitate an end to austerity. The Yes campaign has, for the most part, managed to walk a fine line over the past month. It has referenced the uncertain and precarious situation Ireland would find itself in if voters were to reject the referendum, yet at the same time, touted the benefits that would inure to this country if voters say Yes and affirm Ireland’s close connection with Europe. There have been two primary faults with the Yes campaign. First is that advocates of a Yes vote have, at several key instances, failed to adequately rebut what they have termed the manifestly untrue claims of the No side about what options would be available to Ireland if the referendum is rejected. It is one thing to allege that the other side is misleading the electorate; it is another to describe exactly how it is doing so. On several occasions, and maybe through no fault of their own, given the pressurised, time-limited chaos of television and radio debates, backers of a Yes vote have been found wanting in this regard. The second fault, which seems to have gained some real traction on the ground, is the refusal of the Taoiseach (Irish prime minister), Enda Kenny, to engage in a debate on the merits of Ireland’s signing up to the fiscal compact. Invited to participate in a television debate moderated by the ever-controversial journalist, Vincent Browne, the Taoiseach refused. Invited again to participate in a television debate to be moderated by another journalist, Ursula Halligan, the Taoiseach once more declined. A rhetorical question some voters are asking is why should they support a referendum that will entail sacrifice when the leader of the country won’t stand up in a public forum and defend his own support for it? Meanwhile, No campaigners have packaged their message as well as possible. Socialist Party MEP (member of European Parliament) Paul Murphy and his party colleague, Clare Daly TD (member of Dáil Éireann, the lower house of Irish Parliament), have emerged as strong media performers. They have provided politically effective and realistically plausible justifications for their opposition to the referendum. Sinn Féin has also run an effective campaign for a No vote. This has been spearheaded by its very capable, vibrant and articulate TDs, Pearse Doherty and Mary Lou McDonald. Declan Ganley, a wealthy businessman, unsuccessful candidate for the European Parliament and head of the Libertas movement, which urges greater democratic accountability from Europe, has emerged as another spokesperson on the No side. Whether he is a help or a hindrance to the No campaign is debatable. He is viewed unfavorably by much of the electorate. His ties to right-wing elements in the United States and elsewhere were brought to light when he and others from Libertas sought seats in the European Parliament in 2009. However, Ganley may convince a small number of voters sympathetic to his views about Europe that they should vote No. The announcement by Shane Ross TD that he is voting No on the referendum may prove a bigger boost to the No campaign than Ganley’s intervention. Ross, the erstwhile business editor of the Sunday Independent, is an establishment figure with an iconoclastic streak. He represents the relatively wealthy, reliably pro-European Dublin South constituency. Ross’s position on the referendum could cause some middle- class voters to question their reflexive tendency to endorse Europe at the ballot box this time around. Fianna Fáil’s own prominent advocate of a No vote, Éamon Ó Cuív, has kept to his word and not been heard from since he announced his opposition to the referendum. Moreover, party leader Micheal Martin’s approval rating has improved over the past month. Evidently, the Irish electorate respects the way he handled the turmoil within his own party. But Ó Cuív, and a few other local Fianna Fáil politicians, will be voting No, as will a not insignificant slice of their following in rural Ireland. These grassroots Fianna Fáil No voters will doubtless be joined in their opposition to the referendum by some members of the Labour party. Its advocacy for a Yes vote has damaged the Labour party politically – at least in the short term. The most recent polls show that its support has slipped rather dramatically. Regardless of the outcome of the referendum, Labour has a battle on its hands to maintain the allegiance of voters on the left, many of whom have been lured away by Sinn Féin, the Socialist Party and the People before Profit grouping. They claim that Labour no longer speaks for the left and, instead, merely does the bidding of its senior partner in government, Fine Gael. This battle for the hearts and minds of left-leaning voters will reach fever pitch as the local and European elections approach in 2014. Of all the parties, Sinn Féin appears to have profited most from the referendum campaign. Their anti-austerity mantra has resonated with a significant segment of the electorate and their leader, Gerry Adams TD, has the highest approval rating of any party leader in Ireland. The problem for Sinn Féin though is what precise course of action the party will prescribe in the event that the referendum is rejected. When asked during the campaign, the responses of their typically forthright spokespeople have been “wishy-washy” at best. Sinn Féin’s undeniably increasing popularity is predicated, in large part, on decrying the current state of affairs in Ireland and opposing harsh measures to rectify matters. Taking the next step will not be easy. This has led some cynical and hardened, yet politically savvy, commentators to opine that Sinn Féin would be best served if voters approved the referendum by a narrow margin. That way, it can continue to bang the drum about austerity without really having to engage seriously with how Ireland is going to emerge from the difficult place it now finds itself in. On election day, if precedent is any dictate, voter turnout will be decisive to the outcome. As political columnist Noel Whelan observes in The Irish Times, the higher the turnout, the better the chances of a Yes vote. Indeed, to break the numbers down further, the higher the turnout, the bigger the Yes majority. This unambiguous pattern has emerged from the nine previous popular votes on European Union-related issues. The Yes side will certainly be buoyed by unanimous opinion polls showing it with the lead and will naturally do everything it can to make sure voters get to the polls. But just what percentage of voters will cast ballots is tricky to gauge, and there is a general feeling of apathy in the electorate. Many don’t believe that either a Yes or a No vote will produce positive results for Ireland and one in five remains undecided. Additionally, there may well be something of a “hidden” No vote in a disgruntled citizenry that the opinion polls just can’t account for. This murk will become clearer at some point on Friday.